The NCS Album is presented like a larger version of the NCS Atlas, with one double page NCS Colour Triangle for each of the 40 hues of the NCS Colour Circle. Colour judgments can be made easily in the context of the NCS Colour Triangle. In addition there is a page of pure and tinted greys. Each of the 1950 NCS colours is represented by a set of 3 x A9 NCS Sheets tucked into pockets on the page. These sets can be replaced, see NCS Sheet. 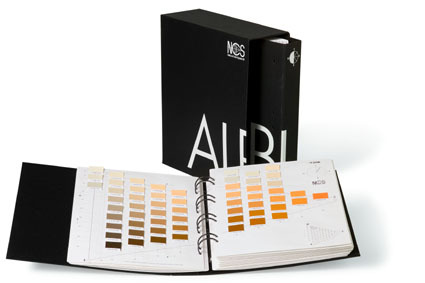 The NCS Album is rather large, so is best kept for use within a studio, but is ideal for use where colour samples are required for immediate use to compare to each other, edge match and attach to drawings. NOW with NEW Colour Masks and similarity page.